How to get there: We flew to Nairobi, used public transportation (a van service) to Arusha, the nearest town with western quality hotel accomodations. 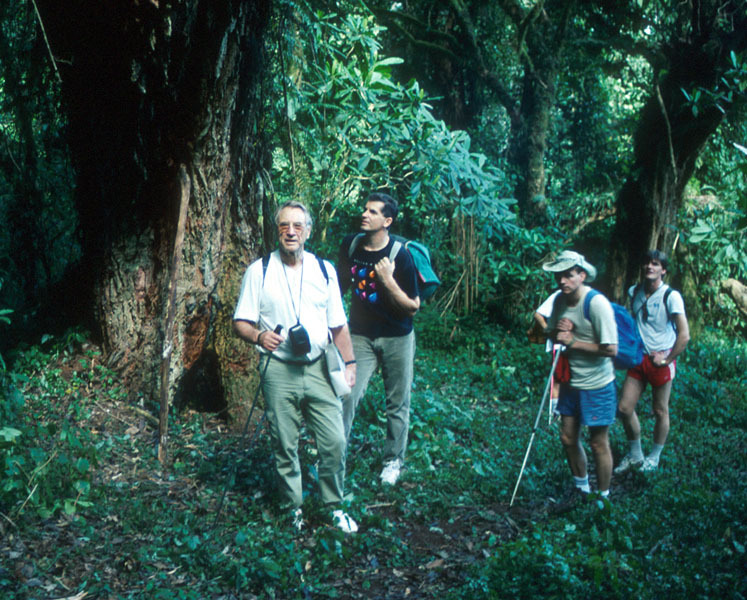 The road from Arusha to the National park entrance takes a few hours, there is a Kilimanjaro airport half way there. Guides are required, the tourist traffic is an important source of employment for locals. You can arrange this before arrival or probably equally inexpensive on the spot. 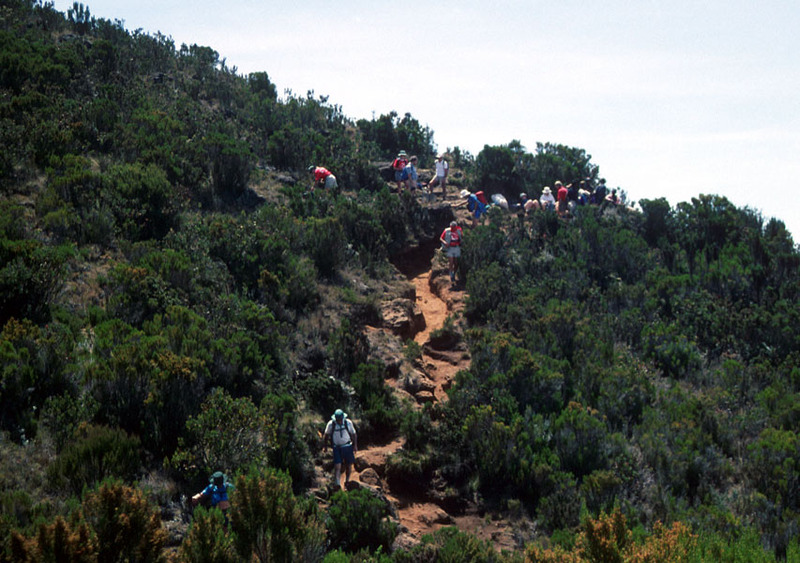 Route description: We used the standard (Marangu) route. Here follows a short trip report that may also be used as a rough outline of the route, including some variations as well some advice based on my own experience. Day 1: from the park entrance (1800m) through dense forest to the Mandara hut at about 2700m. 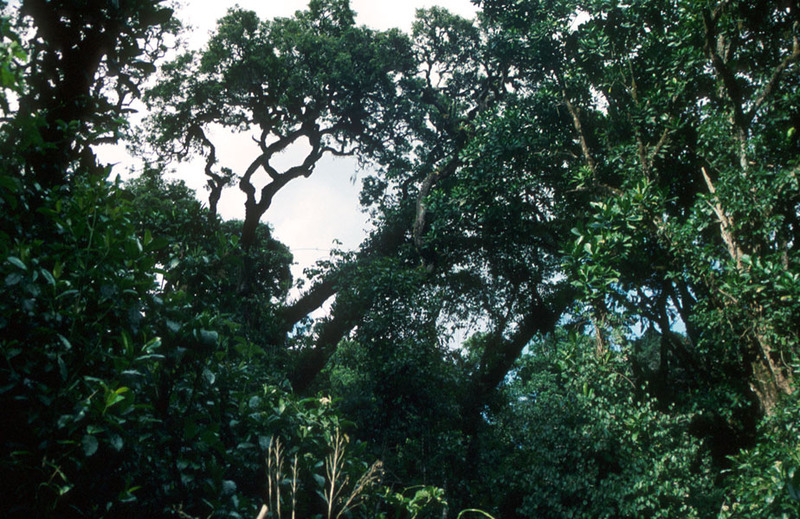 There are wild monkeys looking down from the trees. 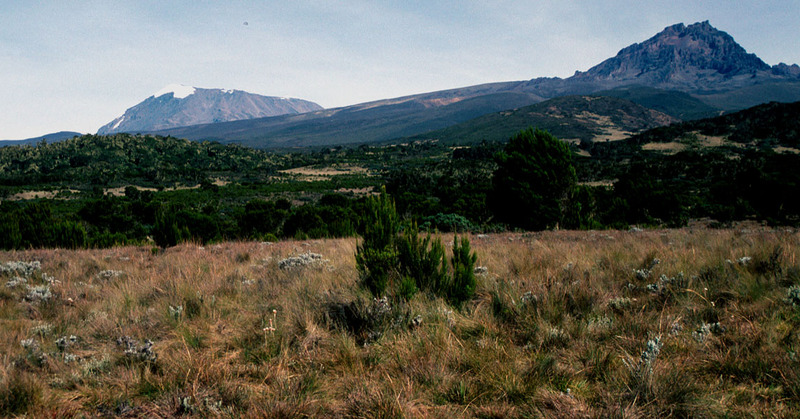 Day 2: continues out of the forest, where the first view of Kilimanjaro appears. 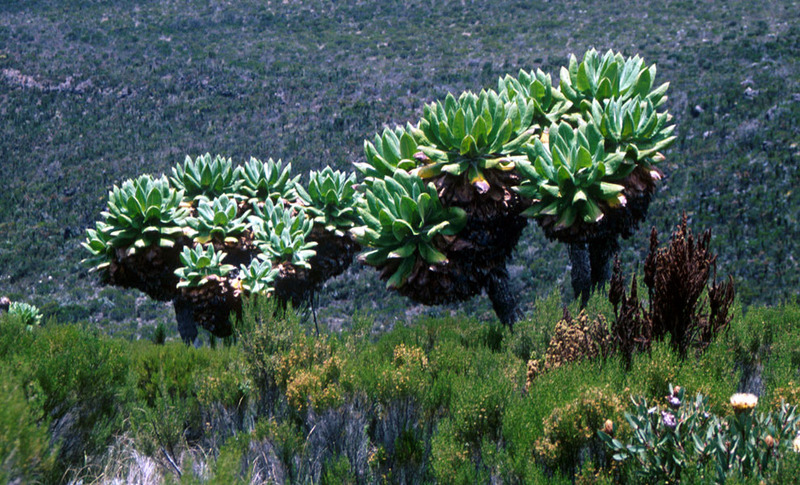 The trail climbs a bit more, you will pass encouraging signs and high country interesting plants and flowers. 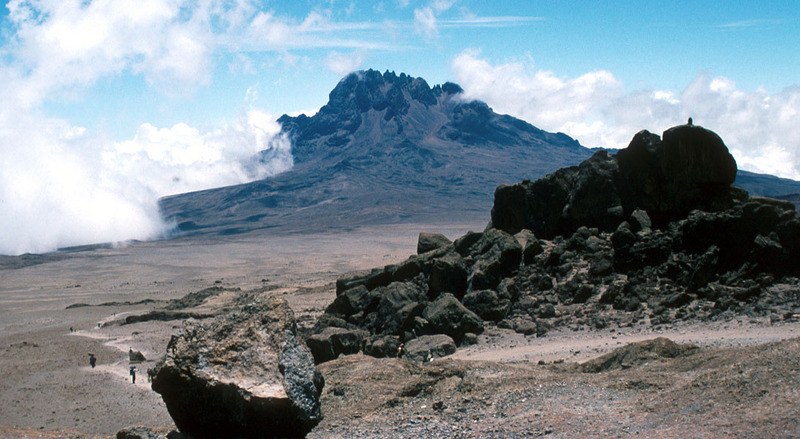 The jagged skyline of the lower Mawenzi also appears, already quite a bit closer than our goal Kibo, the highest summit of Kilimanjaro. 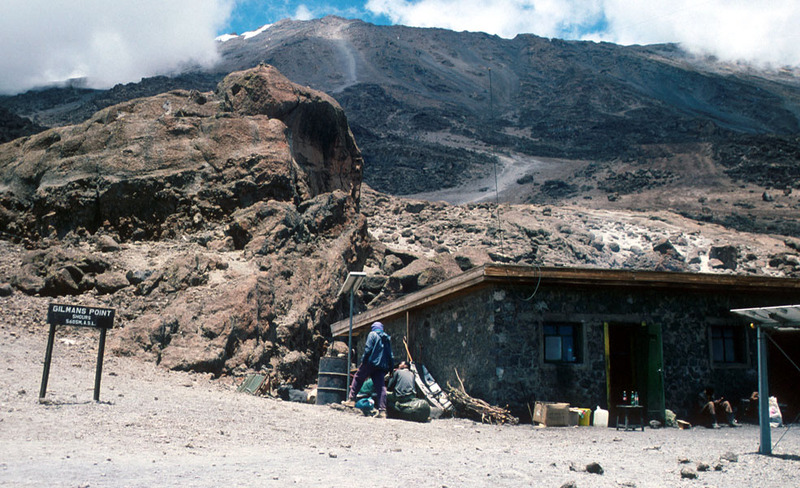 We catch up with our porters and shortly thereafter arrive at the Horombo huts at 3720m. Day 3: is an acclimatization day. At this elevation, the day starts with a very nice sunrise and soon Kibo is bathing in the morning sun. 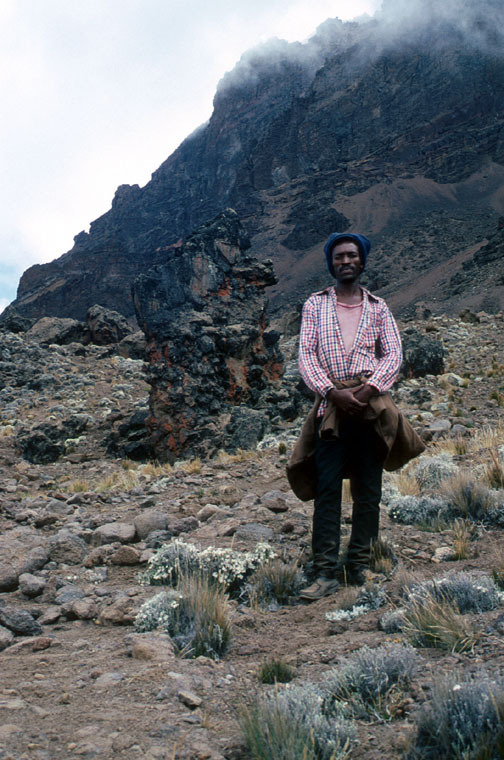 I got a "personal guide" and decided to go for an acclimatization hike towards the slopes of Mawenzi. 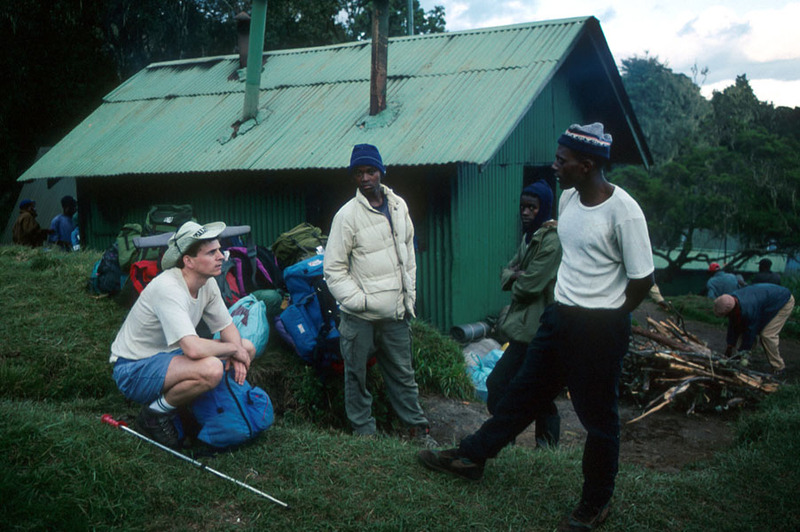 A short hike brings you to the Mawenzi hut, a small shelter compared to the huts along the route to Kibo. From here, Mawenzi looks quite imposing. 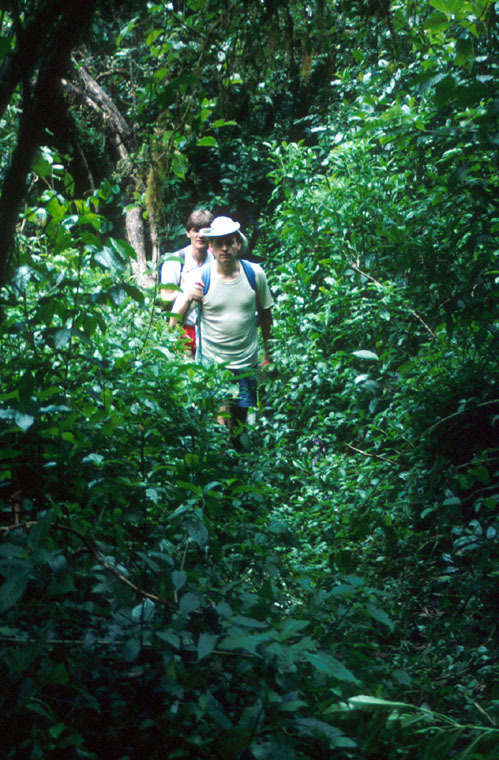 The guide was first unwilling to go any higher quoting that he had never been in the area before. Eventually, after I gave him food and some warmer clothing, we proceeded higher on the slope. 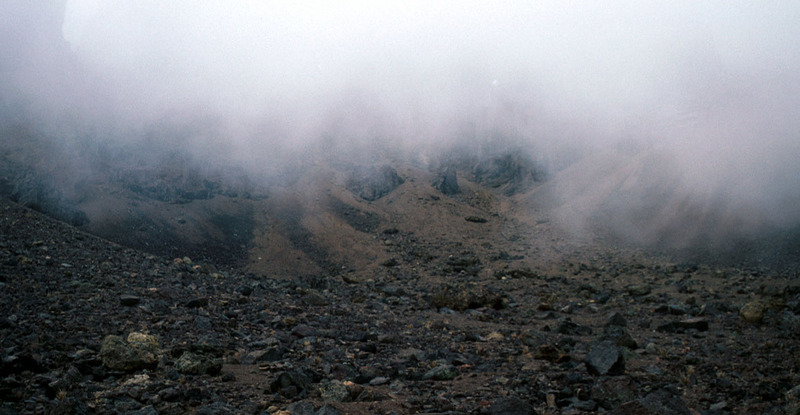 The rock is not good and unfortunately, dense clouds/fog moved in on us making further route finding very difficult. 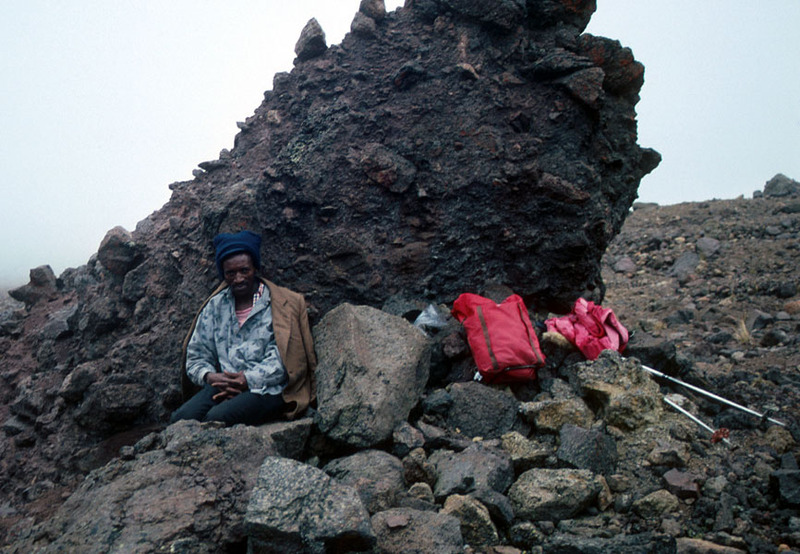 We made it to some kind of saddle at about 4800 meter before turning and finding a rock suitable for a rest. The top is known to be quite difficult (technical), but the trip was nice and further improved my acclimatization for the subsequent climb of Kibo. 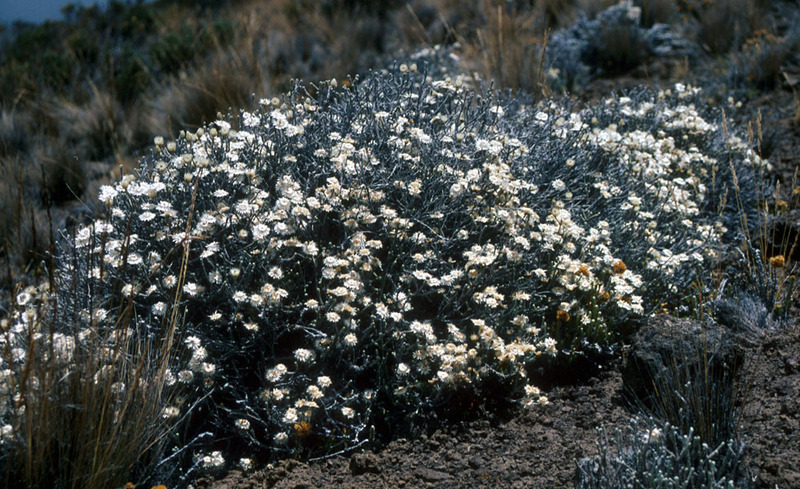 We returned to Horombo enjoying the nice flowers that somehow manage to grow in what otherwise seems like an arid and inhospitable environment. Day 4: Kilimanjaro looks closer, as if she expects a visit, when I start out the next morning. A bit to the right of some smaller patches of snow one can see a grey line extending down a long, wide gully. 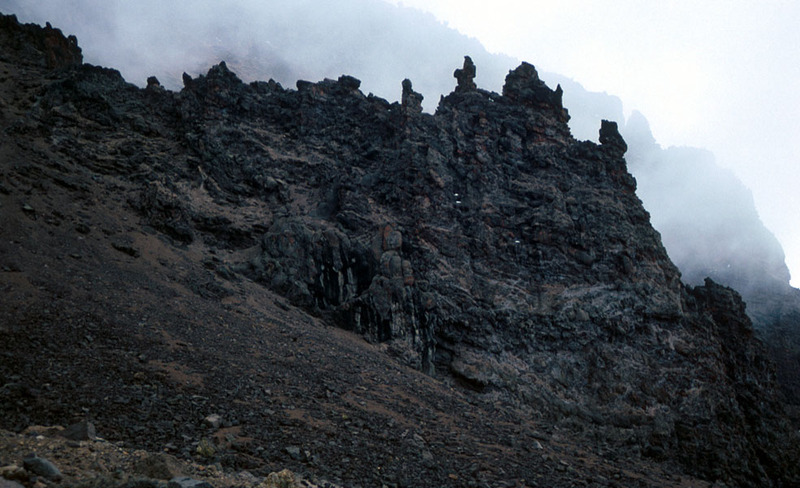 This is the main trail up to Gilmans Point on the crater rim. 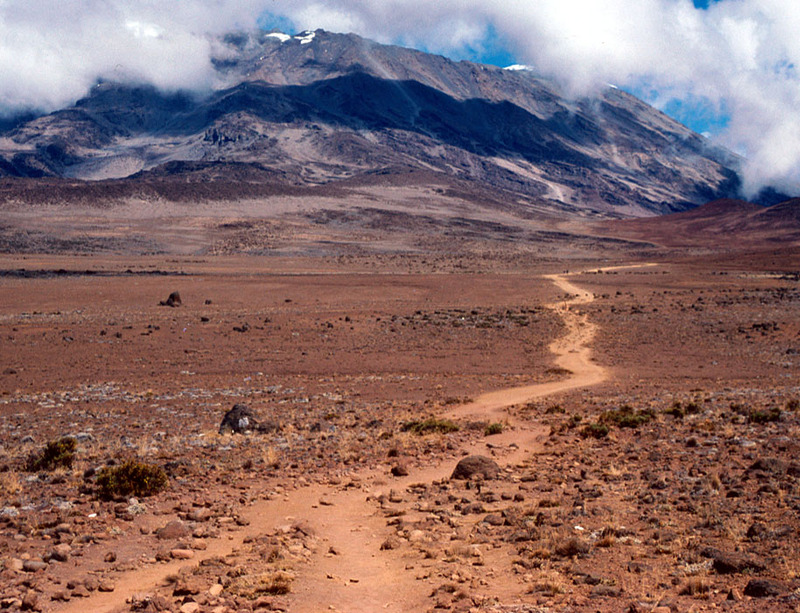 The trail to Kibo hut starts out pretty flat, then climbs a bit more towards the end before reaching Kibo hut (4700m). From the Kibo hut, you have a very nice view right across to Mawenzi where I climbed in the fog yesterday. The trail to Gilmans Point starts just behind the hut, the long gully with loose rocks can be seen higher up. Day 5: Summit day. 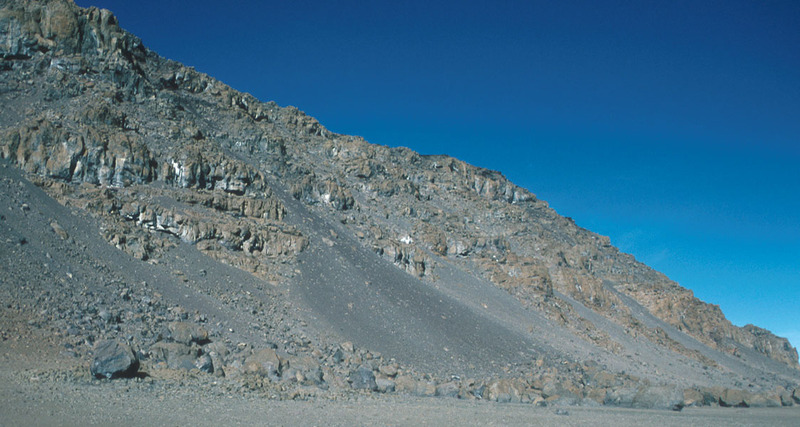 We started around 0100, the first part is a long hike up in partially loose gravel to Gilmans point (5685m) on the crater rim. There are few places with a more brilliant sky, filled with sparkling stars than 5000 meter above sea level on Kilimanjaro between midnight and the early dawn. 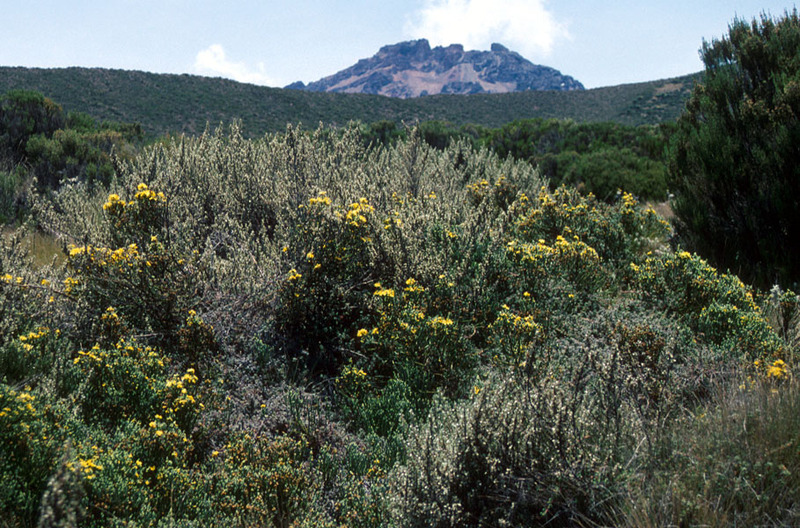 From Gilmans Point, clockwise on the rim to the highest point Uhuru peak (5895). I reached the top at sunrise at 0600, it seemed that most climbers would hit Gilmans Point around this time and normally arrive at the summit around 0800. 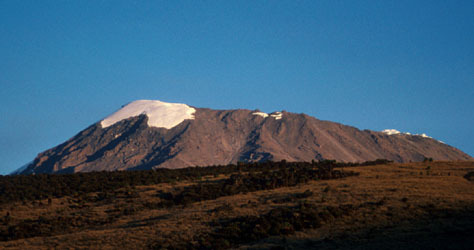 Notice how the sun is rising above Mawenzi and how much lower Mawenzi looks from this point. 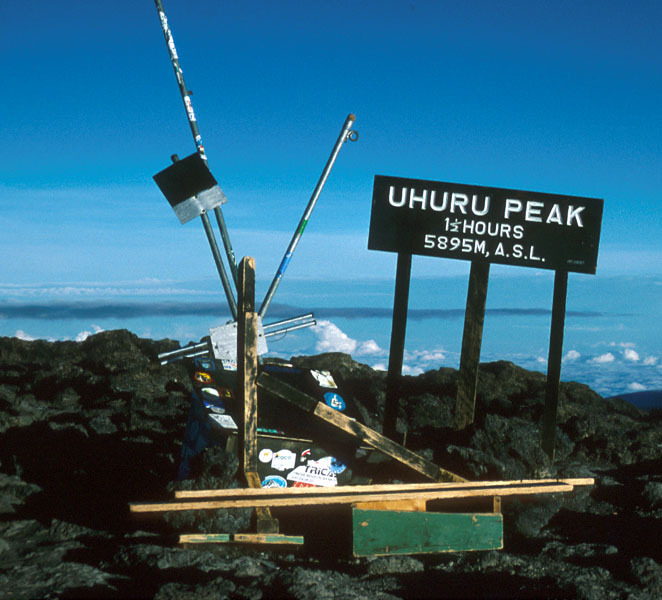 The summit, Uhuru Peak looked like a local junkyard, why the sign says 1.5 hours is also unclear, must have been moved. Hopefully, somebody has made this place a bit more tidy since 1994. "The Snows of Kilimanjaro" (Ernest Hemingway, 1938), is actually very impressive ice formations. They are quite different from snow of ice I have seen in other mountain landscapes. 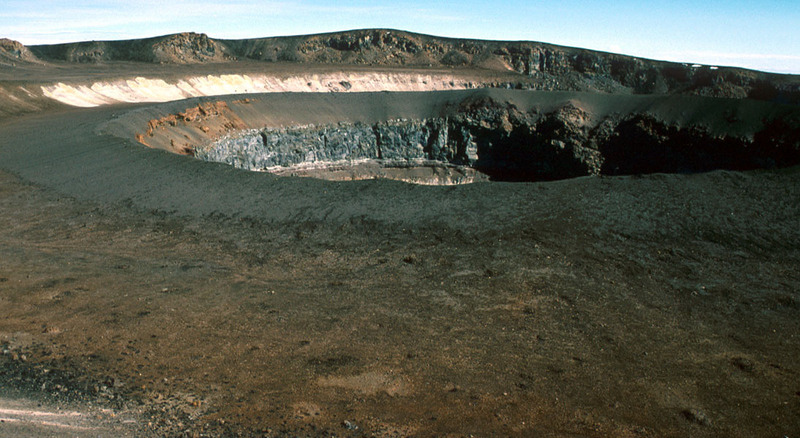 On the return I hiked down into the crater proper and up on a smaller cone with a more recent crater inside it. Then back up to Gilmans point ( a tough uphill after a long day at more than 5500m!) 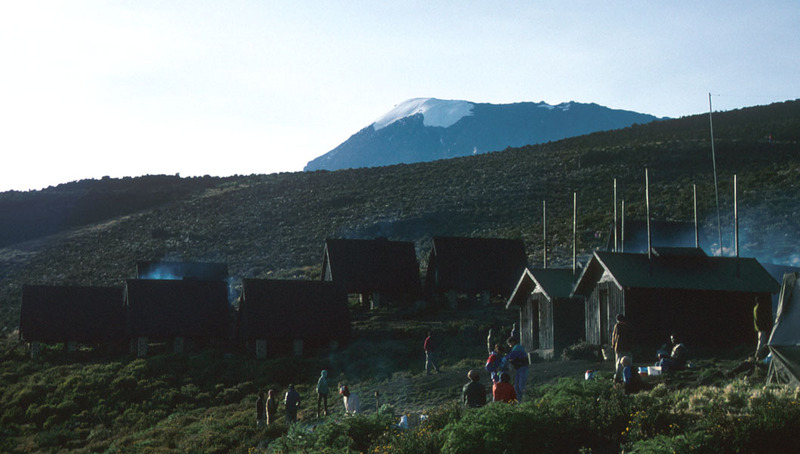 The return hike to Kibo hut is easy and one continues down to the Horombo huts the same day. 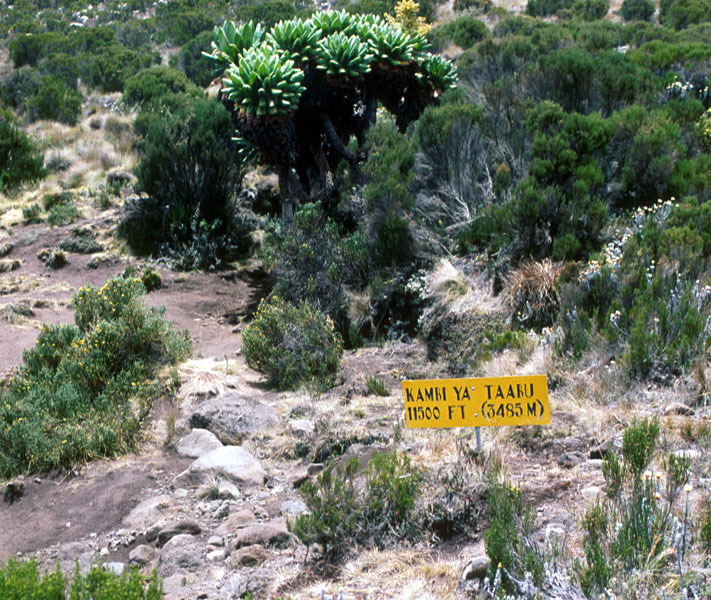 There is an alternate trail from Kibo hut to the Horombo huts which can be recommended, it crosses more directly towards Mawenzi (near the Mawenzi hut) before turning right. Day 6: is an easy hike all the way down to the park entrance. Comments: This climb is different from most mountain climbs. 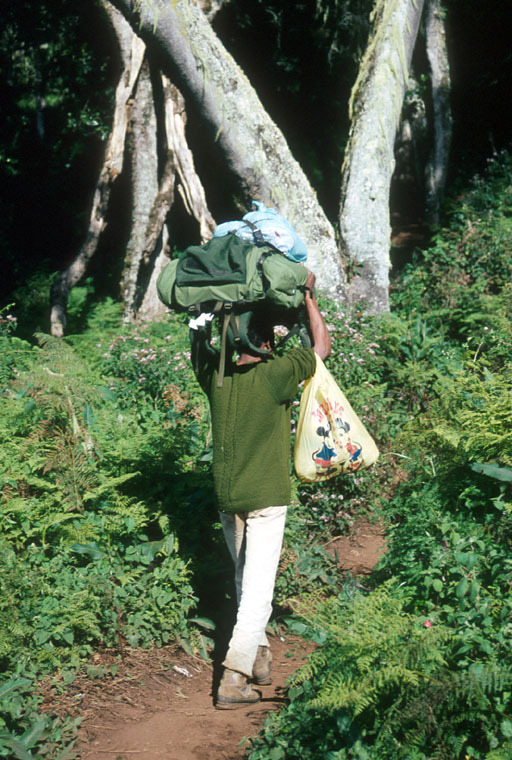 First, there is the unusual luxury to have a porter carry your pack and a guide doing the cooking. 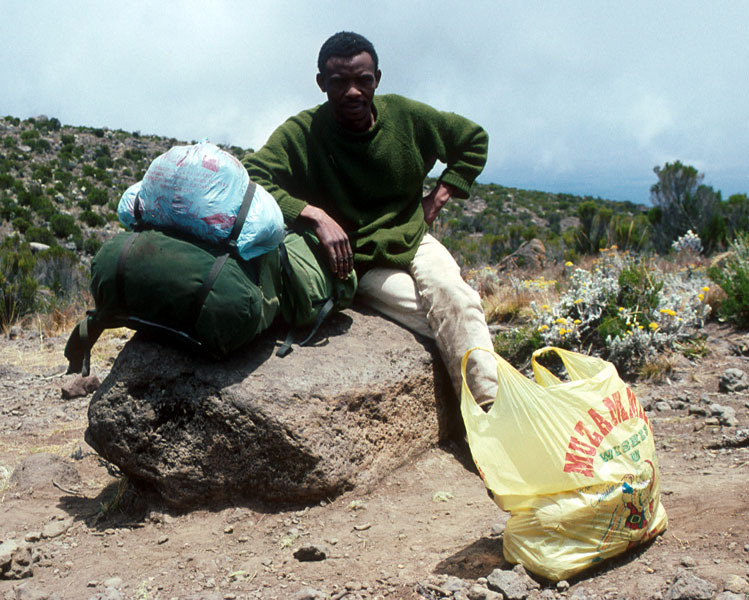 You carry your day pack only, the porters do not go any higher than Kibo hut. Second, the climb takes about a week and takes you from dense tropical forest to the impressive ice walls of the top glacier. The summit is almost 6000m, the temperature can be minus 10 Celsius or colder so bring warm and windproof clothing. 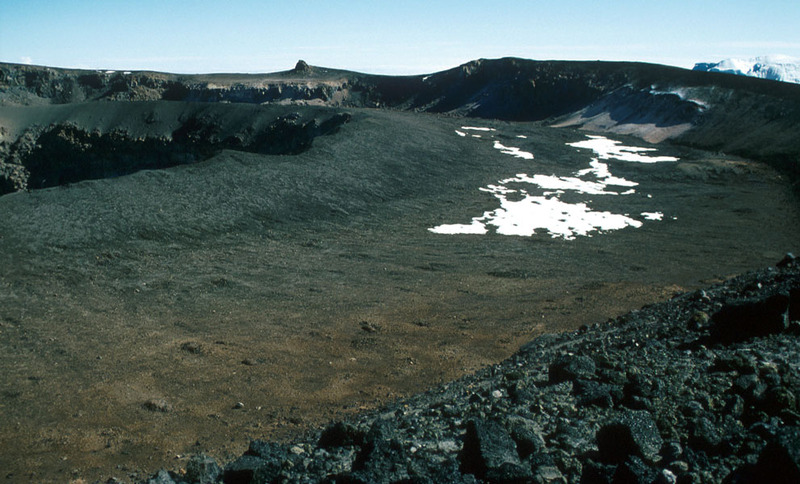 Third, the hike inside the crater can be recommended if you are well acclimatized, but this must be agreed upon with the guide in advance or he may try to charge you extra for this service. There is not a single place were you really need to use your hands, it's an easy walk all the way except for altitude problems that seemed to affect almost everybody above 5000m. It is pretty clear that a summit bid on day 5 is too soon for almost everybody. 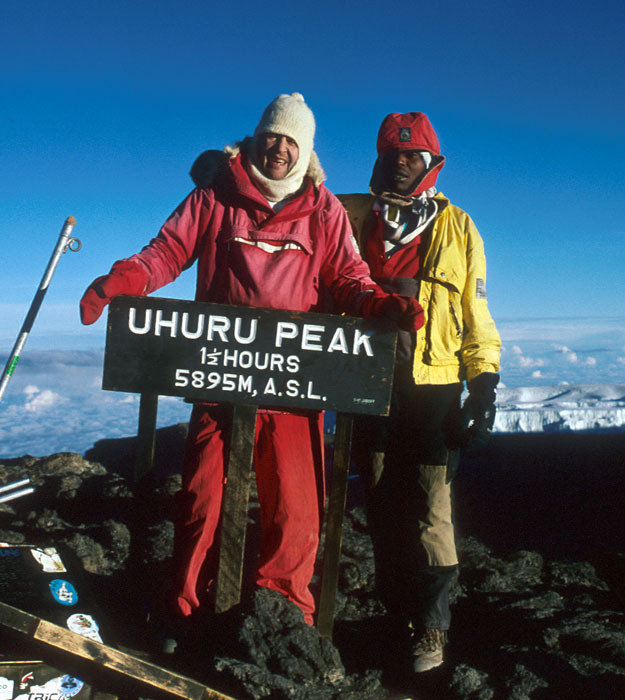 Uhuru Peak, the top of Africa.